A lovely heirloom to share with family and friends. 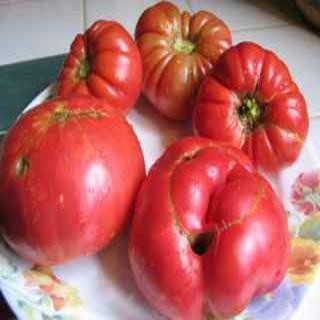 Deep rose-pink tomatoes from these seeds with lots of fluting, ruffles and different shapes; many one-two pounds. Heirloom Seed Packet. It was so much fun it was to walk upon the Pink Calabashes in a row of tomatoes this Summer. Deep rose-pink with lots of fluting, ruffles and different shapes; many one-two pounds. It was even more fun to taste their strong, sweet tomato flavor. A real Summer treat. A lovely heirloom to share with family and friends.